The Dragon (Jin from Korean), the fifth animal in the Chinese Zodiac, is the only animal represented that is (as far as we now know) mythical. It has been a source of stories and beliefs for thousands of years and holds its own special place in the 12/ 60 year cycle. It is known as the “mightiest of the signs” (chinesezodiac.com) and in China, many couples wait for the year of the Dragon to have a baby so that it will be born under this fortuitous sign. 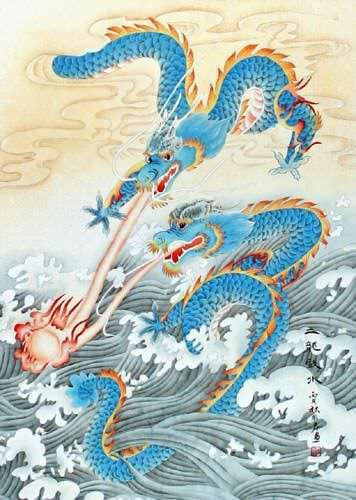 This year is a Year of the Dragon- it is the Year of the Water Dragon in the 60 year cycle, in which the 5 Elements are paired with the 12 Animals. Black is the color of Water so it is also known and the year of the Black Water Dragon, or the Year of the Black Dragon. “Dragons symbolize such character traits as dominance and ambition. Dragons prefer to live by their own rules and if left on their own, are usually successful. They’re driven, unafraid of challenges, and willing to take risks.” (chinesezodiac.com). “A born leader, honest, sensitive, fastidious and verbose, short-tempered. Watching the Dragon form performed, I can visualize the practitioner as a dragon, twisting and turning through the air, and attacking. Especially in the beginning and later sections where the hook stances and crane stance are utilized, and the practitioner is balanced on one foot; first to one direction, then jumping to the next direction, as if he were flying. There are a few kicks but most of the attacks are with hands or fists. While a dragon would attack most with his front claws, teeth and fire- breathing capabilities, he/ she would still certainly be able to deliver a devastating kick, should the situation call for it.